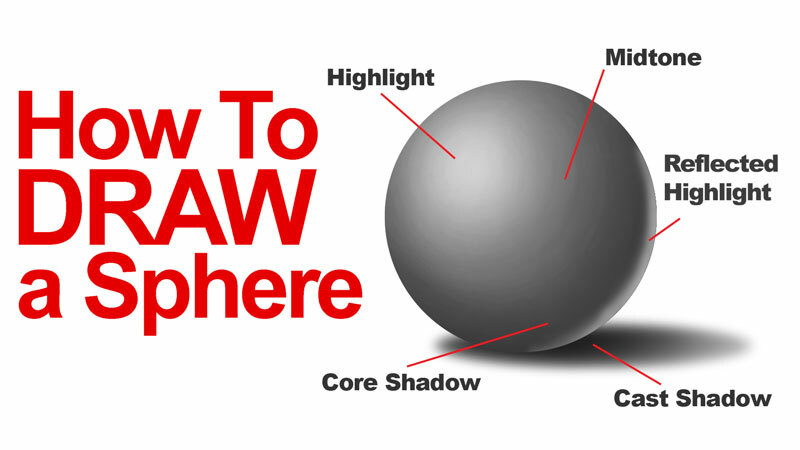 You may be wondering, "why draw a sphere?". After all, there are so many other interesting things in the world to draw other than a sphere. We draw a sphere as an exercise. An athlete spends many hours exercising before the big game. An artist needs to exercise and practice before tackling more complex subjects. These drawing exercises help to train our brain to see as an artist and recognize the elements that we need to address in those complex subjects. A sphere is an excellent subject to practice honing your drawing skills. There are two important reasons why a sphere is such a great subject. 1. Spheres have a full range of value - Value is the darkness or lightness of a color. This important element is what informs the viewer about the light within the scene and the form of the object. A sphere, no matter how strong the light source, will most likely include a full range of darks and lights. This means that you're likely to see super dark values and light values and many different tones in between. By drawing a sphere, we can practice creating that full range of value in our drawing, paying close attention to subtle changes in tone. 2. Locations of value are easily recognized - Not only is a full range of value important, but the locations of those values are equally important. By practicing recognizing these locations on a sphere, we are better equipped to find them on more complex subjects. When you draw any object, you must consider your light source. The light within the scene dictates where locations of value will appear on the subject. By placing specific values in specific locations in our drawing, we can inform the viewer of the strength and location of the light. There are five locations of value that can be found on any subject, but on a sphere, they are easy to recognize and are clearly defined. Highlight - The highlight is location(s) of lighter value on the subject where light is hitting with greatest intensity. Midtone - The midtone is the location of middle value on the subject. Typically, the midtone reflects the local color of the subject. Core Shadow - The core shadow is the location(s) of darkest value on the subject. This shadow is found on the subject opposite from the dominant light source. Reflected Highlight - A reflected highlight is the result of light hitting the surface or surrounding objects and bouncing back onto the subject within or near the location of core shadow. Cast Shadow - Cast shadows are produced on a surface or surrounding objects when light is prevented from hitting those surfaces because the subject is blocking the light. Another benefit to practicing with a sphere is the gradations of value that occur. Unlike on a cube or pyramid, gradual changes of tone occur on a sphere. We can practice creating these smooth and subtle transitions. When using a pencil, smooth transitions of value can be created by making small circular strokes. This technique is often referred to as "circling". We can also change the direction of the strokes so that they flow over the cross contours of the form. The combination of both of these techniques create a smooth gradation of value in our drawings. While a convincing sphere can be drawn without a reference, it's often best to practice from a photo or live subject. Instead of inventing the locations of the value and tones, we can observe them. Drawing is all about seeing.